Wow, I’m very impressed… You must be one of the very few that are actually interested in a gas water heater maintenance. While performing home inspections, I have asked hundreds of homeowners about this simple procedure and a raised eye brow was usually the answer to my question. With a few simple gas water heater maintenance steps you can get years of reliable operation from your appliance. Most of those steps can be easily performed by a homeowner, however, there are a few that should be carried out by a qualified service personnel experienced in gas water heater repair. Just like with every appliance, your gas water heater maintenance should be performed on regular basis. Neglecting this requirement can compromise the proper operation of your appliance. The outcome could be hazardous, result in Carbon Monoxide poisoning and hot water scalding. I divided this gas water heater maintenance schedule into 3 parts just in case you don’t like to scroll too much. I highly recommend to read all of them but you can use quick links below to jump between them as well. 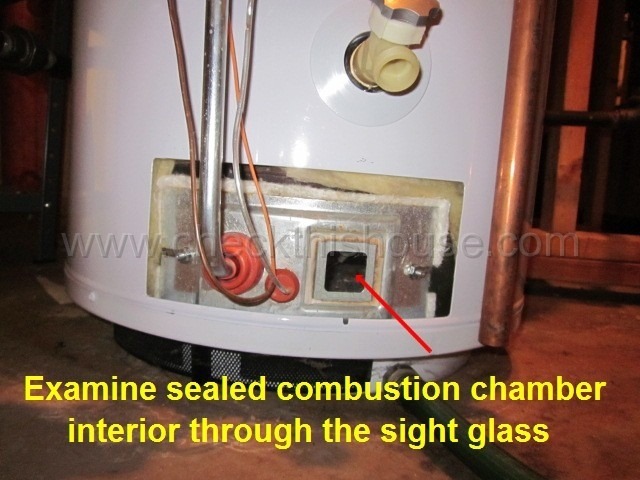 Water heater’s combustion air – extremely important! Look through the sight glass and inspect the pilot burner flame with the main burner off and the main burner while firing. To activate the burner run your hot water faucet(s) for a few minutes or increase the temperature setting – remember to return dial to the original position after testing (120°F starting point is recommended). If you observe soot buildup inside the burner chamber or / and dominating yellow – orange flame, the water heater should be turned OFF and serviced by a licensed professional. Servicing of the water heater burner contained within the sealed combustion chamber must be performed by a licensed / qualified professional. After removing the burner’s access door, its gasket must be replaced. Remove the burner chamber covers (be careful – they may be HOT) and observe the pilot flame with the main burner off and with the main burner while firing. The only difference from the sealed combustion chamber evaluation is that you should not look into the chamber while attempting to ignite the burner! Wait until the WH burner is on (after running hot water for a while or increasing the temperature setting) and then look inside (use safety glasses), while keeping a safe distance to prevent an injury from heat. Malfunctioning, improperly adjusted open burner chamber water heaters may cause a flame roll-out while firing, so be careful – call a professional if something like that happens. The burner flame should light smoothly from the pilot or igniter. Standing or dripping water – condensation is normal, especially after running hot water for a long time. However, if it doesn’t evaporate and keeps accumulating at the base of your water heater; turn off the gas shutoff valve, turn off the water shutoff valve and call the plumber. Turn the temperature dial to vacation setting and the pilot knob to OFF position. If the pilot stays ON, turn OFF the gas shutoff valve and call the plumber! Make sure that the water heater’s chamber interior is cool enough to perform cleaning. 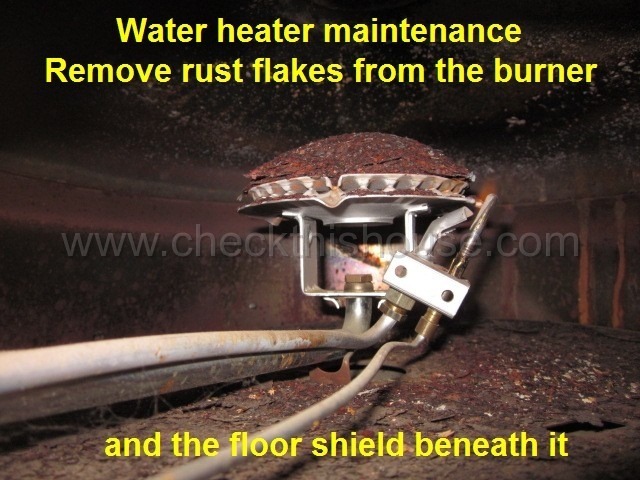 A vacuum cleaner attachment can be used to remove rust flakes from the burner and the floor shield beneath it. Be extremely careful around the pilot area / igniter device – some designs are very delicate and easy to damage. Any larger objects will have to be removed by hand (use safety gloves for that). Some objects you can expect (I’ve seen them all) are birds, mice, rats, and corroded flue baffle. 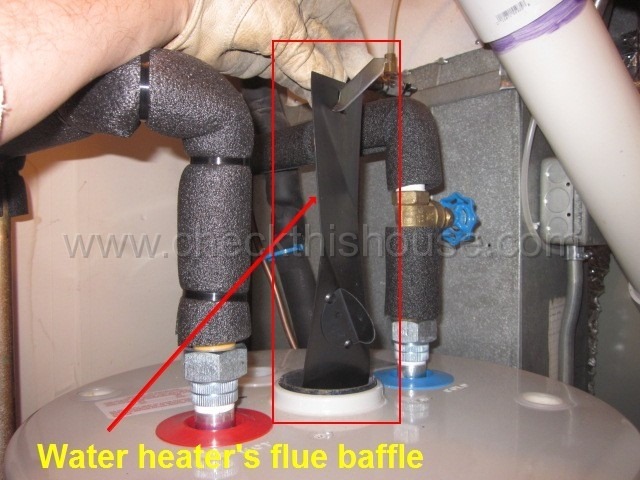 A flue baffle (more about it in “Gas water heater maintenance 2”) is normally suspended inside the flue, directly above the burner. After its hooks / brackets or bottom sections corrode, deteriorate, they may fall down onto the burner in which case the flue baffle requires immediate servicing / replacement – it’s a SAFETY HAZARD – call a plumber. 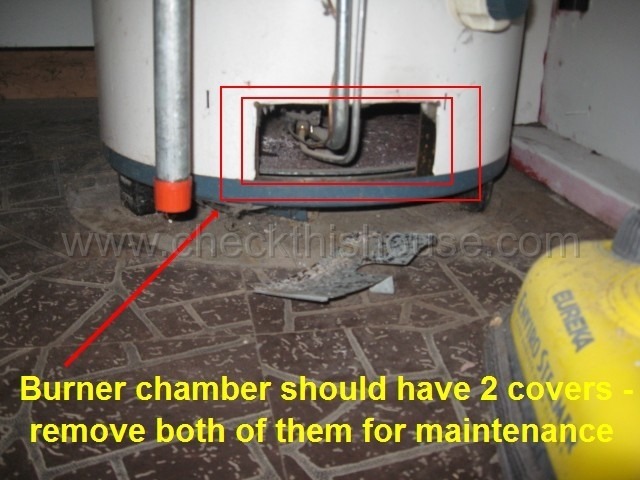 Please continue to Gas Tank Water Heater Maintenance Part 2 that covers TPR valve, water heater tank drainage and internal flu-way maintenance. 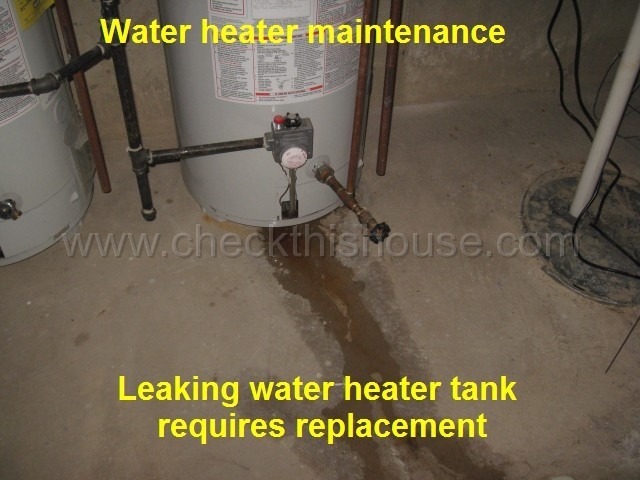 Remember to go over all 3 Parts of the gas water heater maintenance procedures.